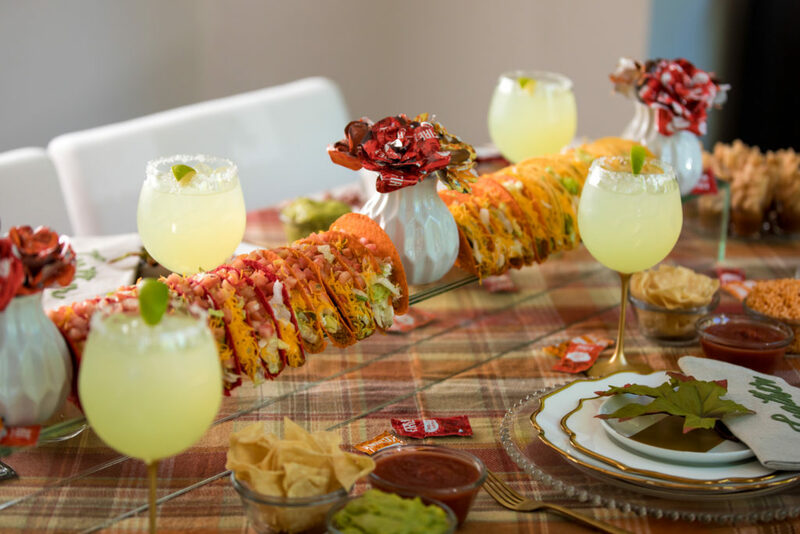 Tacos are usually reserved for Tuesdays, but who says you can’t serve them any day of the week, and who says you can’t serve them for Thanksgiving? Not me! 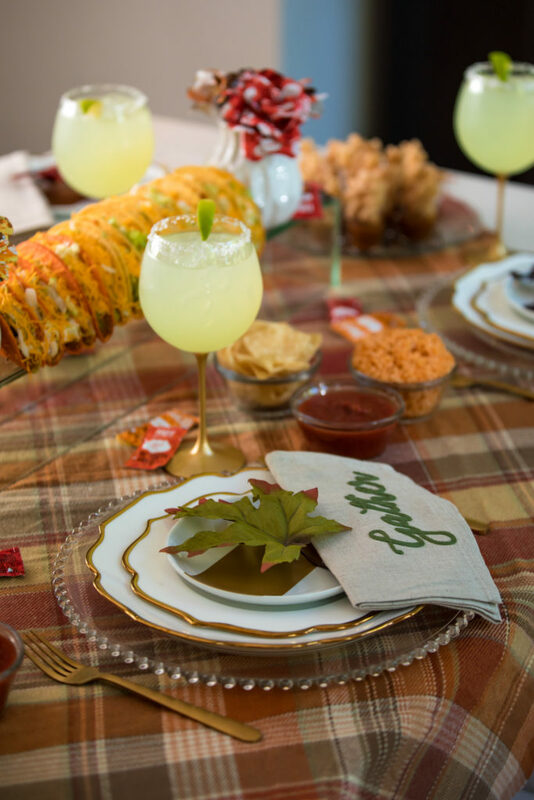 We’ve taken one of the most popular food items in America and turned it into your new favorite meal for Thanksgiving. 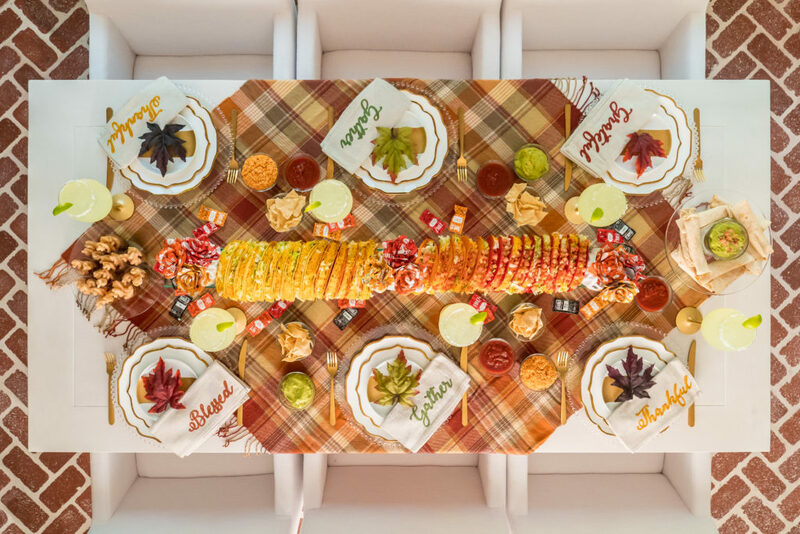 Read on to see my collaboration with Grateful to bring you a fast food Friendsgiving: Taco Bell style! Just because you’re serving fast food, doesn’t mean that your table has to look any less glamorous! The food is the centerpiece here! Three dozen tacos does the trick! Instead of using a tablecloth, a plaid throw provides the base for the table and softens the white wood with the beautiful harvest hues of Fall. Glass chargers and gold flatware give the place setting a bit of shine and elegance. My favorite Lenox dinnerware matches perfectly and the gold stemmed wine glasses add to the color scheme. 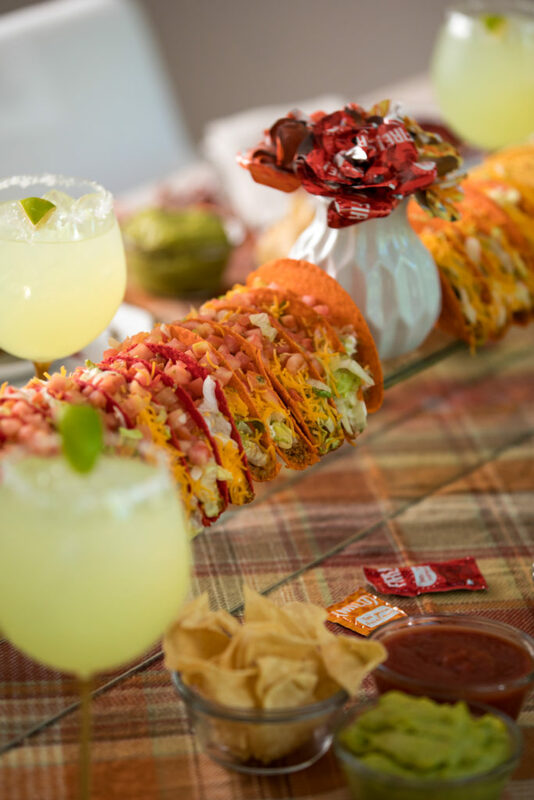 Keeping the main entree to just one item simplifies the night – tacos in a variety of shell flavors looks so pretty on the table and give your guests a choice of fillings. Of course you can’t have tacos without chips, guac and salsa! 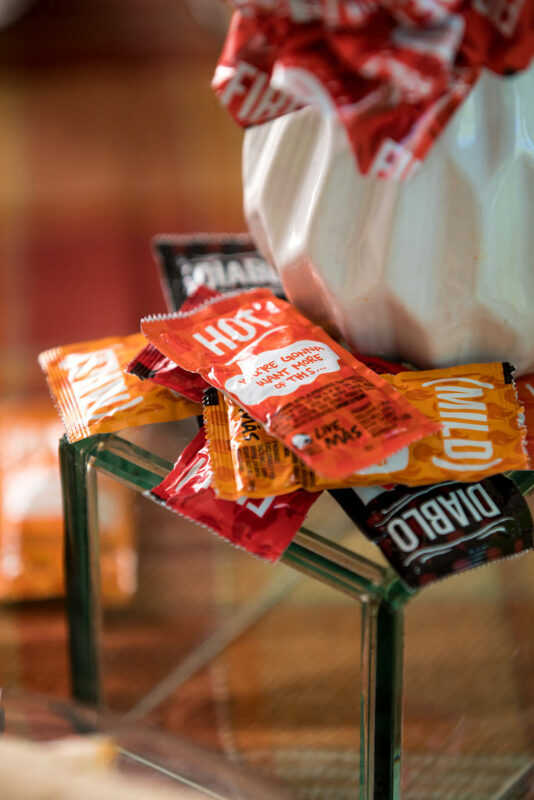 Hot sauce for every palate! The advantage to putting your food in the middle of the table is that is becomes your centerpiece! 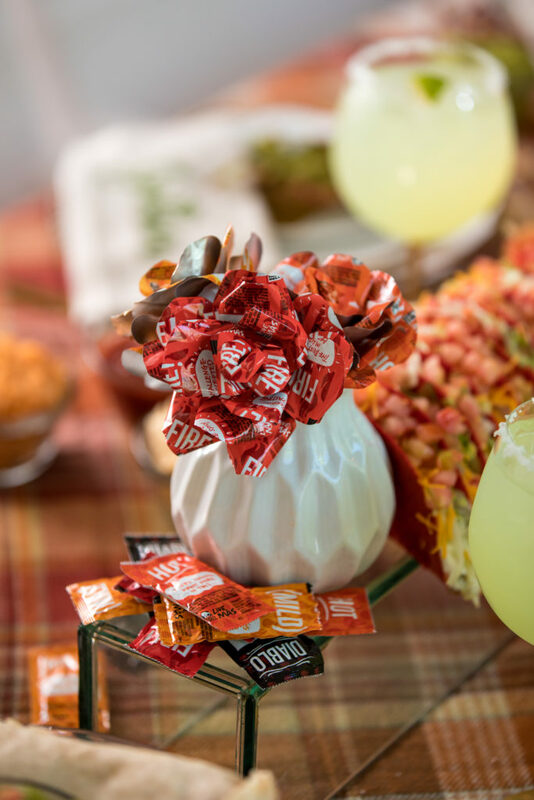 These hot sauce bouquets were the only “flowers” on the table – how creative is this?? 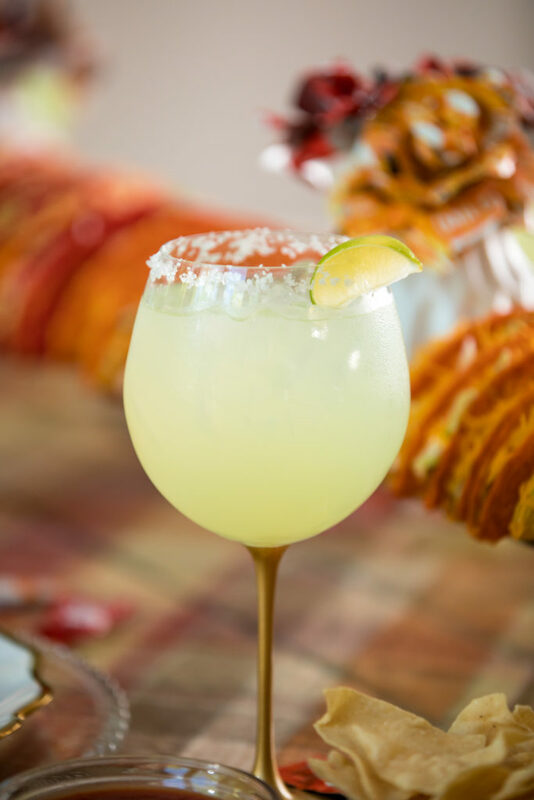 Margaritas served in salted wine glasses elevates the decor to a high Thanksgiving standard! Here’s my favorite 3-ingredient, simple but classic margarita recipe! 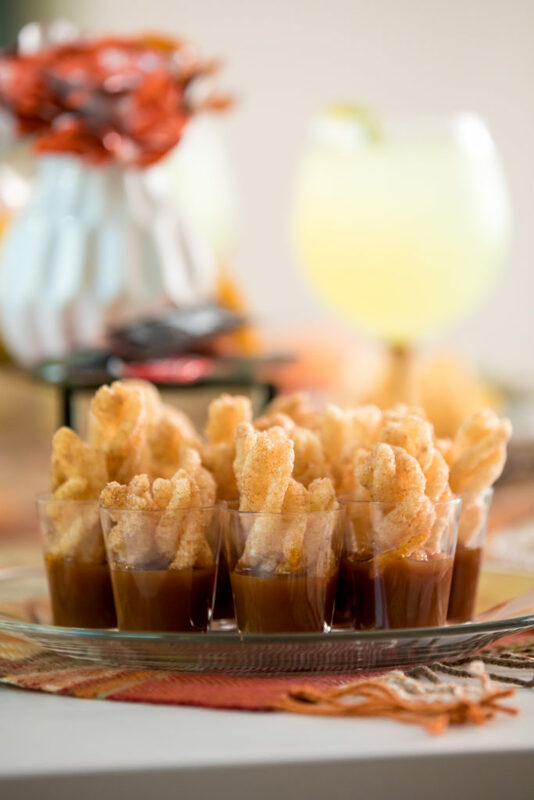 Dessert is essential – churros in shot glasses filled with caramel sauce is a perfect ending to this dinner! I think your winter forest table is magical. The beautiful blue accents the China ;the glass hand blown trees add a bit of a winter chill. I can’t stop looking at it!